Will Medicaid Pay for an Electric Wheelchair? Medicaid is the largest program designed to provide medical and health-related services to people with low incomes. Medicaid may cover a complex rehab electric wheelchair if the patient meets eligibility requirements. To qualify for Medicaid, an individual must meet income and resource limits, and be medically needy or fall into an eligibility category specified by your state. Anyone receiving Supplementary Security Income (SSI) benefits is automatically eligible. Medicaid will only pay for a motorized wheelchair if the individual has a medical need for the specific motorized wheelchair. There must also be a doctor's prescription written for the patient and the type of power wheelchair he or she needs. Some states require physical therapy reports or special forms to be completed. For individuals who qualify for both Medicare and Medicaid, sometimes Medicaid will pay the portion of the cost of a power chair that is not covered under Medicare. Medicaid may also cover the cost of a power adjustable seat height on a complex rehab electric wheelchair. Medicaid will consider funding for power adjustable seat height on a case by case basis when it is shown to be essential for transfers, reach, access, safety, communication, and/or to support identified vocational and educational goals. 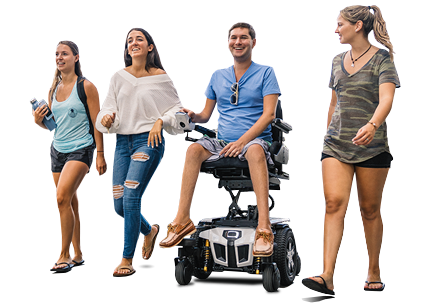 iLevel® power adjustable seat height from Quantum Rehab® improves daily functionality and quality of life by allowing operation of the power wheelchair with the seat elevated up to 12 inches while being driven at at 4.5 miles per hour.